This Sunday is Easter and for a lot of people that means celebrating with an Easter egg hunt! 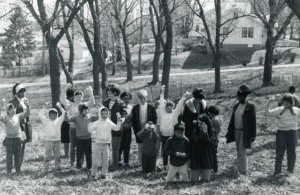 This black and white photo shows about a dozen children and several adult volunteers standing in a park near the Nebraska Children’s Home Society located in Omaha. This photograph is from Nebraska Children’s Home Society collection on the Nebraska Memories archive. Interested in Nebraska history? Visit the Nebraska Memories archive to search for or browse through many more historical images digitized from photographs, negatives, postcards, maps, lantern slides, books and other materials. 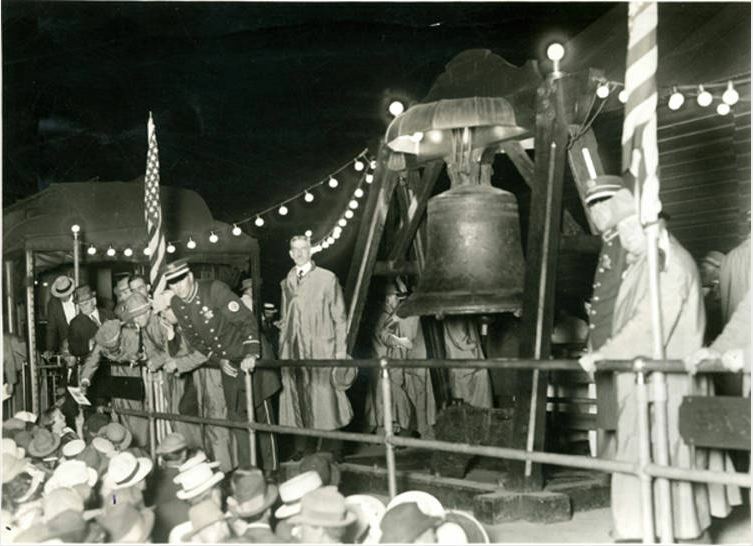 Check out this week’s #ThrowbackThursday from the Nebraska Memories Archive. 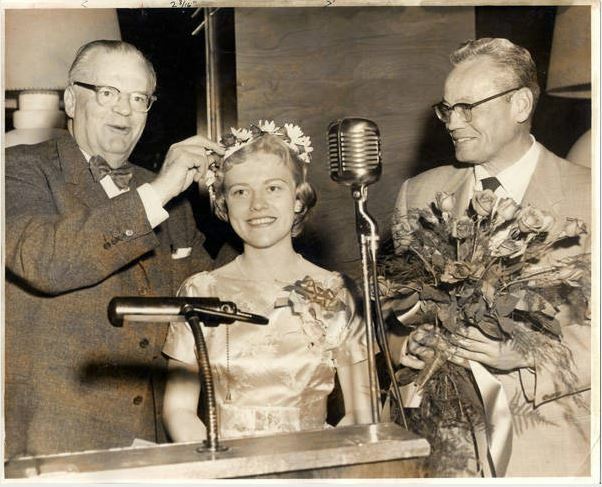 This black and white photograph shows Dorothy Gredstrom being crowned the School of Nursing Seniors Queen of the College World Series in June of 1959. From 1950 through 1991, the College World Series included CWS “Sweethearts.” Nine young women were selected to represent area service clubs, colleges, universities, etc. Omaha sports writers and sportscasters then picked one to be the CWS Queen. In this photo we see Edward F. Pettis, a man instrumental in the early development of the College World Series, crowning Dorothy with a crown of flowers. 1959 was the thirteenth year of the CWS, the tournament’s champion was Oklahoma State, coached by Toby Greene. This photograph was provided and is owned by the Alegent Health Immanuel Medical Center. An archive of thousands of photos, papers and items has been maintained for over 120 years, carefully stored and currently housed at the Alegent Health Immanuel Medical Center campus. With the assistance of the Nebraska Library Commission, this sampling of items from the Immanuel collection has been made available through the efforts of the Fall 2008 and Fall 2010 Advanced Cataloging class at the University of Nebraska at Omaha, under the guidance and direction of the instructor, Corinne Jacox, and Karen Hein of the University of Nebraska at Omaha. A few weeks ago, I had a conversation with a librarian about old seed catalogs. I must admit that before the conversation I’d never thought about seed companies or their catalogs. 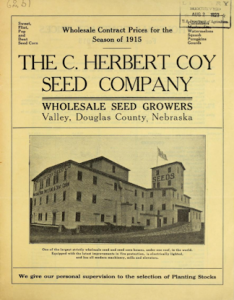 I’d seen photos of seed companies in Nebraska Memories and I thought their main business would have been selling corn, wheat or other seeds that farmers needed along with some basic seeds for the garden. Because of that conversation, I found the US Department of Agricultural Library’s Henry G. Gilbert Nursery and Seed Trade Catalog Collection. The collection contains over 200,000 items and currently 41,683 of them have been digitized and made available through the Internet Archives. In the digitized collection, I found 644 seed catalogs or price lists from Nebraska including items for all three seed stores pictured in Nebraska Memories. After looking at these catalogs, I realized that these seed companies sold a lot more than seed corn. Let me share with you what I learned about these three stores. 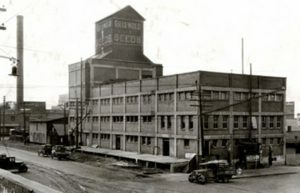 This photo from 1928 is of the Griswold Seed and Nursery Company’s elevator and warehouse. This warehouse was built in 1910 at the corner of 8th and N Street in downtown Lincoln. In 1994, the building was sold to the Midwest Steel Company. As you can see in Google Street View, the building is still being used today. I found 27 catalogs from the Griswold Company in the US Dept. of Ag collection. Looking through the catalogs, I learned that the company was started in 1891. 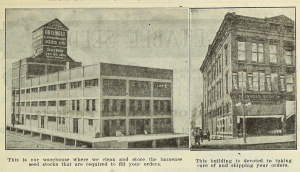 The image to the left is from the 1916 catalog and shows the elevator and warehouse and their retail store that was located at 147 S 10th St. If you are familiar with Lincoln, this is the address of the parking lot next to the Terminal Building. On this same page of the catalog, they mention that their name is now Griswold Seed & Nursery Co. Previously it was just the Griswold Seed Co. The photo of the Griswold elevator and warehouse was taken in 1928 so I looked at the Griswold Seed & Nursery Co. Spring 1928 catalog. The catalog has 92 pages. 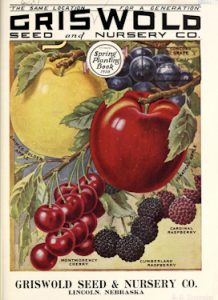 The front cover shows a couple of varieties of apples and berries. Looking at the index, I’m guessing there are over 400 items listed including a variety of flowers, vegetables, trees and bushes. I checked and they did sell field corn, wheat and sugar beets. 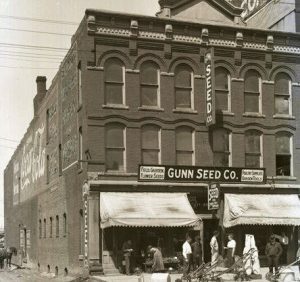 The Gunn Seed Company was located at 219 S. 10th Street in Lincoln. This was just down the block from the Griswold retail store. That location is also currently a parking lot. If you take the time to look at the photos of the Gunn Seed Company, it is obvious that they sell a variety of items. The smaller sign above the door says Gunn Seed Co. Poultry Supplies. The larger sign mentions Field, Garden, Flower Seeds on one side and Poultry Supplies / Garden Tools on other. On the sidewalk in front of the store is a collection of plants, gardening tools and bags of feed. There are 10 documents from the Gunn Seed Company included in the US Dept. of Ag collection. 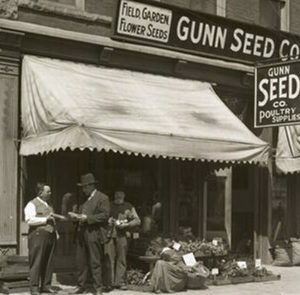 Like the Griswold Seed Company, Gunn sold a variety of vegetable and flower seeds. They also offered a wide variety of poultry supplies. 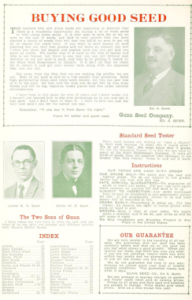 Both photos of the Gunn Seed Company were taken in 1916. 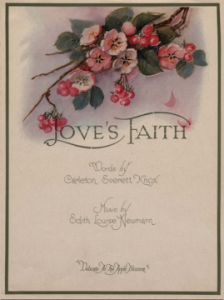 Their first catalog available in the collection is from 1919. I’m not sure when the Gunn store first opened. I looked in the 1908 city directory and did not find the Gunn Seed store listed but I did find an entry for Gunn, Edwin S. who was listed as the “mngr retail dept Griswold Seed Co.”. I looked through all of the Gunn seed catalogs and in every one of them is a picture of Ed. S. Gunn. My guess is that Edwin left Griswold Seed and started his own company but I wasn’t able to find any documentation that confirmed this. 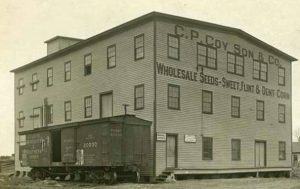 This photo of the C. P. Coy & Co. building located in Valley was taken around 1910. We don’t know the exact date of the photo was taken. We do know that it was built in 1903. My search of the US Dept. of Ag’s collection for Coy was successful as I found 16 different seed price lists. As I started looking at them, I realized there were two companies with similar names. There were seven prices lists from Chauncey P. Coy and Son. This name matches the name on side of the building. The dates of the price lists range from 1901 to 1926. The address listed on all of these price lists is Waterloo, NE however. The two names listed in the 1902 booklet were C. P. Coy and H. G. Coy. The other nine price lists are from the C. Herbert Coy Seed Co. of Valley. They range from 1916 to 1926. The 1915 catalog has a picture of the same building that is in Nebraska Memories. The name on the building is now C. Herbert Coy Seed Co.
At first, I thought C. Herbert might be the son but the names didn’t match up. I found more information about C. Herbert in the 1917 book Omaha: The Gate City, and Douglas County, Nebraska, Volume 2. In the short bio about him, it states that he moved to Valley from New York in 1901 to start his company. There is no reference to him having family in Waterloo. 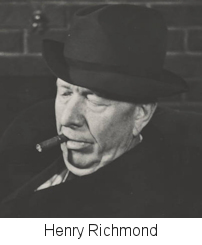 According to a family tree created by a distant Coy relative that I found in the MyHeritage Library Edition database Chauncey P. Coy would have been Charles Herbert Coy’s uncle. Both the Coy companies were wholesale seed growers. Their price sheets were set up to sell seed by the pound. They offered a limited selection of seeds including cucumbers, melons, gourds, and corn. I hope you enjoyed learning a little bit about these three seed companies. Visit Nebraska Memories to search for or browse through many more historical images digitized from photographs, negatives, postcards, maps, lantern slides, books and other materials. Nebraska Memories is a cooperative project to digitize Nebraska-related historical and cultural heritage materials and make them available to researchers of all ages via the Internet. 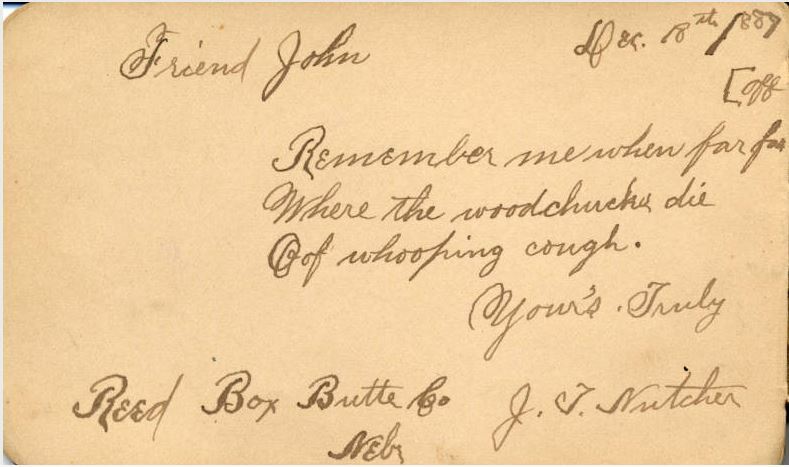 Nebraska Memories is brought to you by the Nebraska Library Commission. If your institution is interested in participating in Nebraska Memories, see http://nlc.nebraska.gov/nebraskamemories/participation.aspx for more information, contact Devra Dragos, Technology & Access Services Director. With the 2018 Primary Elections being held last week I thought it would be a good time to highlight a few former legislators whose photos are included in Nebraska Memories. When Nebraska became a state in 1867 it had both a Senate and House of Representatives. The four men whose photos appear in Nebraska Memories were all members of Nebraska’s House of Representatives. Thomas Wolfe was born in Germany in 1847. His family moved to Wisconsin shortly after his birth. He worked at a variety of newspapers including the Tribune in Chicago, the Evening Post in New York, the Republican and the Bee in Omaha, and the Nebraska Reporter in Seward. In 1877 became president of the Butler County bank in David City. Thomas Wolfe was a member of the Nebraska House of Representatives from 1877 to 1879 representing Seward County. Thomas also served as the president of the Nebraska Press Association from 1879-1880. Thomas and his wife Madessa had three children Leonel, Thomas Jr. and Medessa. Mat Miller was born in Scotland in 1850. He immigrated with his family to Wisconsin when he was two years old. Both of his parents died when he was eight leaving him and his three siblings as orphans. At the page of 14, Matt ran away an d enlisted in the Union Army. He was discharged in 1866 and after completing high school and graduating commercial college, he moved to Burt County Nebraska. In 1879, Matt and his first wife Sarah moved to Schuyler and a year later Matt was admitted to the bar. In 1881, he moved to David City and practiced law in town for 42 years. Matt was elected to the House of Representatives and served from 1885 to 1889. Matt also went on to serve as judge for District 5 in Nebraska from 1891-1892. 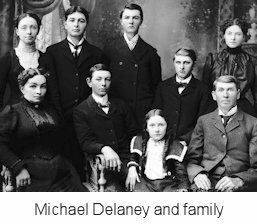 Michael Delaney was born in 1843 in New York. When he was two, his parents moved to Wisconsin. He later moved to Iowa where he was a teacher and a farmer. In 1872, he purchased a farm in Butler County Nebraska. In addition to serving as a member of the House or Representatives from 1889-1891 and 1895-1897 Michael held numerous other positions. Some of the positions he held included county superintendent of schools, school director for his district, a member of the Board of Supervisors and Justice of the Peace. Michael and his wife Katherine had seven children. Henry C. Richmond was born in 1870 in Missouri. 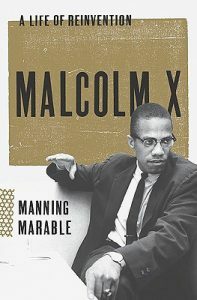 As a child, his family moved to Kansas and later to Webster County Nebraska. Henry worked at a number of newspapers including the Red Cloud Chief, Omaha World-Herald, and the Fremont Daily Herald. In 1907, he was elected president of the Nebraska Press Association. In 1911 and again in 1913 Henry was elected chief clerk of the Nebraska House of Representatives. Henry Richmond served as a member of the House of Representatives from 1915-1917 representing Douglas County. Following his term in 1917, he became the secretary for the Nebraska State Council of Defense. Henry passed away in May 1945 in Portland Oregon. According to his obituary, he and his wife Jeannette had two daughters and three grandchildren. Visit Nebraska Memories to search for or browse through many more historical images digitized from photographs, negatives, postcards, maps, lantern slides, books and other materials. As children all over Nebraska are finishing up the school year we thought this throwback to 1931 was perfect. School buses have changed a little in the last 87 years. This photograph was taken in front of the old Florence Elementary School at 8516 N. 31st Street by Dorothy Edwards, a teacher at the school. 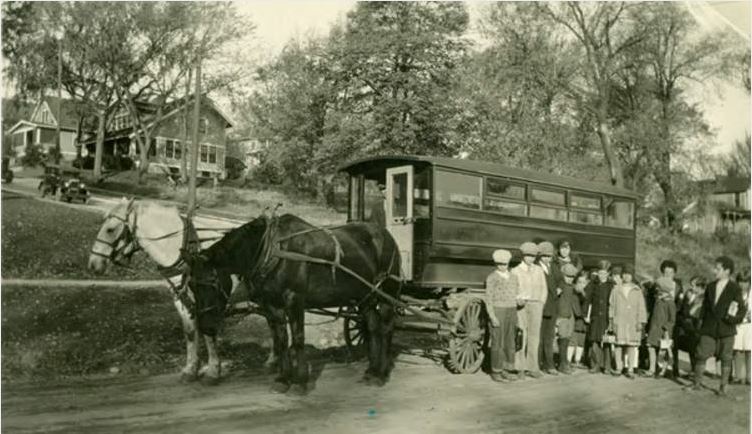 The Florence School bus was owned and driven by Sam Smith, shown standing just inside the door at the front of the wagon. 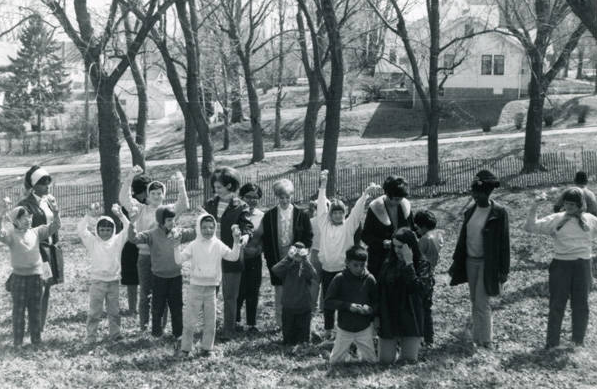 The boy in the center carrying a book is Sammy Smith Jr., son of the driver. The tall boy on the far right, also carrying a book, is Billy Gale. His sister, Vivian Gale (Gast) is the curly-haired girl in the back row. Mrs. Gast stated that she and her brother had red hair. Mrs. Gast also stated the bus was painted a dark green with red trim; the door was yellow. The street where this picture was taken is still unpaved. The old Florence school was closed and torn down in the mid 1960s. It was replaced by the current Florence Elementary on N. 36th Street. Historical materials relating directly to the Omaha Public Schools have been located in various departments and school buildings. Many schools still maintain their own collections. In 2003, staff from the Educational Research Library / Library Services received a small grant to begin collecting and organizing these materials in a central location. This group of pictures and their accompanying stories is but a tiny part of the District’s over 150 year history. Are you still looking for a unique way to express your love to a special someone today? Can you sing, play the piano and/or play the ukulele? If you answered yes, I have a few scores for you. One of the participants in Nebraska Memories is the Polley Music Library. 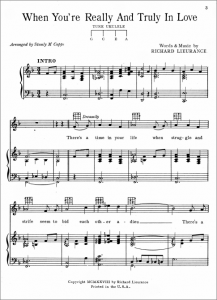 Included in their collection are 256 musical scores. 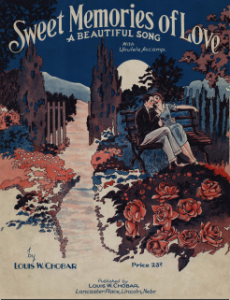 The complete scores are available so if you have the skills you can perform one these love songs for your special someone. 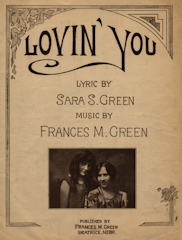 Written by Sara S. Green and Frances M. Green of Beatrice, Nebraska. 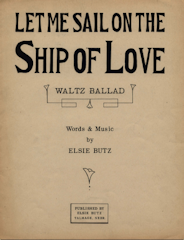 Written by Elsie Butz of Talmage, Nebraska. 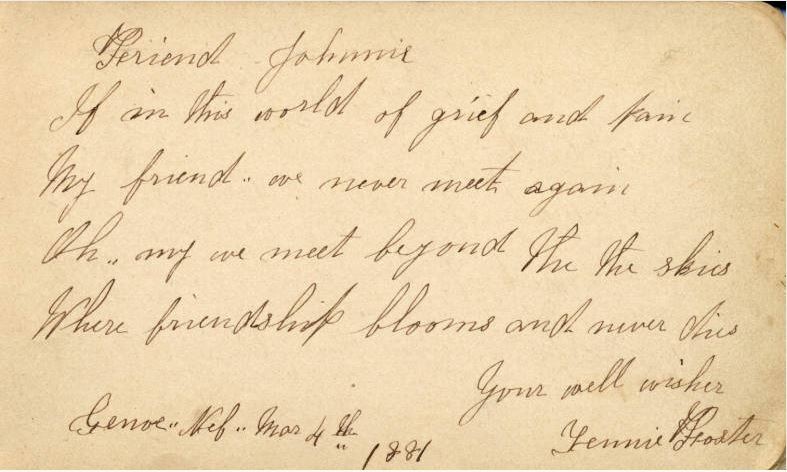 Written by Edith Louise Neumann and Carleton Everett Knox of Wymore, Neb. 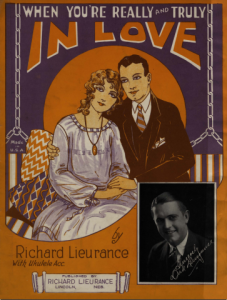 The sheet music was written by Thurlow Lieurance who was a facility member at the University School of Music, Lincoln, Nebraska. This version of the song does not including lyrics. 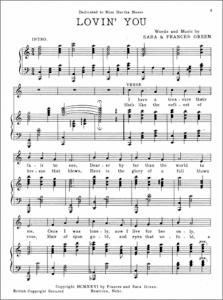 You can also listen to this song being played on the piano. Written by Louis Chobar while he was serving time in a Nebraska prison for a murder conviction. This piece includes an arrangement for the ukulele. 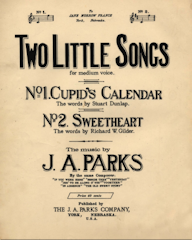 This score contains two songs, Cupid’s Calendar and Sweetheart. After the recent snowstorm, I saw many beautiful pictures of the snow. The pictures were taken by both friends and strangers from across Nebraska. Some were taken to show the amount of snow received while others were taken to show nature’s beauty. 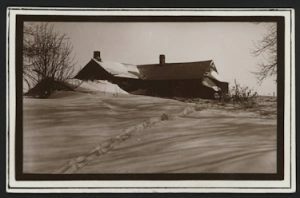 As I was looking at the images in Nebraska Memories today, I noticed a number of similar images of snow taken 100+ years ago. Here are a few of my favorites. The first four photos in this post were taken by John Nelson. John Nelson was born in Sweden and moved to Wheeler County Nebraska with his parents when he was a young man. Eventually he opened a photography studio in Ericson Nebraska. While we don’t know the exact dates these photos were taken, we believe they were taken sometime between 1907 and 1918. 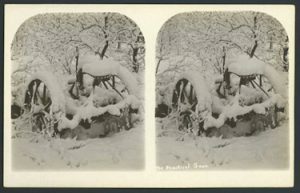 The above stereoscopic photograph shows antique farm machinery covered in snow. On the right image, in the bottom left corner, someone wrote “The Beautiful Snow”. 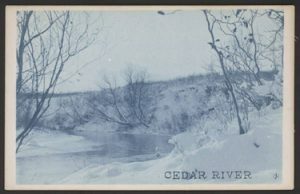 The next photo shows the banks of the Cedar River covered in snow. The Cedar River is a long winding river that starts in northern Nebraska, goes by Ericson, and finally joins the Loup River west of Fullerton, NE. 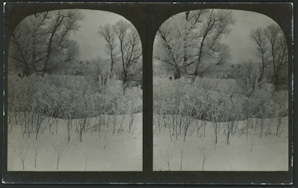 The second stereoscopic photograph shows snow covered trees and field. Images like this are timeless. It’s easy to imagine someone taking a photo like this during the last snowstorm. The fourth picture shows Nels and Bengta Nelson’s farmhouse. They were John Nelson’s parents. The snowdrifts look large and the tracks in the snow look deep. Photos of two other buildings caught my attention. 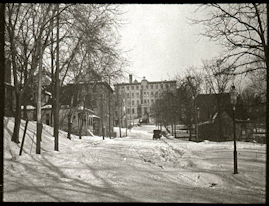 This photo of the Clarkson Hospital in Omaha from the early 1900’s shows a portion of 21st Street in Omaha. The street looks to be snow packed and a little rough. I don’t think it would be a fun street to drive down. 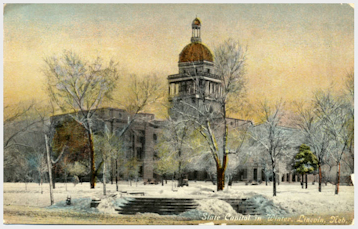 I was surprised when I first saw this postcard of the Nebraska State Capitol in winter. This was the first time I’d seen a postcard of the second capitol with snow on the ground. State Capitol in winter, Lincoln, Neb. While the capitol may look nice surrounded by snow not everyone was impressed with the building. 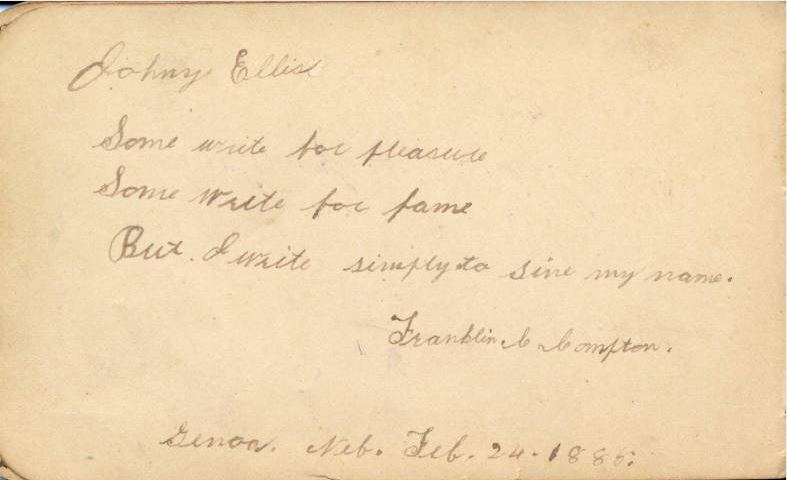 This postcard was never mailed but someone did write a note on the back. Here are their thoughts on the building. “This is an old “ramshackle” place surrounding by a park as shown in picture.” The person’s description of the building was probably correct. Construction on this capitol was completed in 1888 however, the construction was supposed to have been poor. In 1919, the Legislatures passed a bill providing for the construction of a new capitol that still stands today. 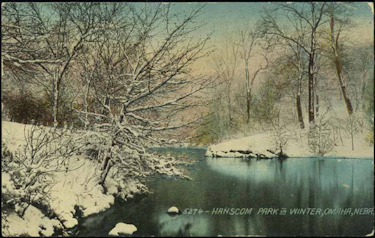 The last three images I would like to highlight are postcards of Hanscom Park in Omaha. Hanscom Park is located about a block west of Interstate 480 and the Martha Street exit. The land for the park was donated in 1872 and was improved in 1889. The park appears to have been a popular spot or at least a popular spot to take photographs. There are 30+ images on Hanscom Park in Nebraska Memories. Winter beauty, Hanscom Park, Omaha, Neb. 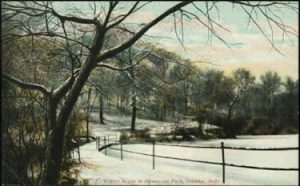 Hanscom Park in winter, Omaha, Nebr. This week’s #ThrowbackThursday takes a look at Nebraska’s higher education! This black and white photograph, 9 3/4″ X 7 3/4″, of the north and west side of Old Main, comes from the Nebraska Wesleyan University, Cochrane-Woods Library Collection. In 2008, the archives launched an effort to digitize, catalog, and describe photographs of NWU’s campus buildings. The collection consists of mainly exterior shots of individual buildings, along with several views of the campus layout as it evolved from 1891 through the 1970s. Old Main was the primary building on the Nebraska Wesleyan campus in 1889. Three white buildings appear on the right edge of the photograph and it appears that three men are reclining on the lawn in front of the building. “#39” is written on the front of the photograph in the bottom left corner, while “NE Wesleyan UN-1889” is written on the back. Nebraska Wesleyan University was chartered on January 20, 1887, and is affiliated with the Methodist Church. 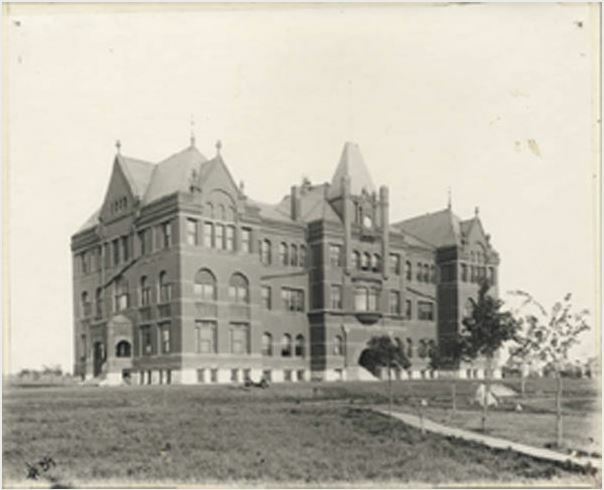 Old Main was constructed in a Richardsonian Romanesque style beginning in 1887. Listen up! We’ve got a new #ThrowbackThursday for you! Located at 325 6th Avenue, the telephone exchange owned by the Nebraska Telephone Company was established in Fairmont in 1882. By 1884, 30 instruments were in use in Fairmont with the central office attending to 300 calls per day, on an average. This picture was taken in 1923 with Lawava Abrams, Mae Crooker McMahon, May Walker, Bess Storm and Alice Crooker Peters. There was also an Independent Telephone company at this time in Fairmont and rivalry between the two companies was high. Cedar Hill Telephone Company and Scott Telephone Company were also vying for a part of the telephone interest. 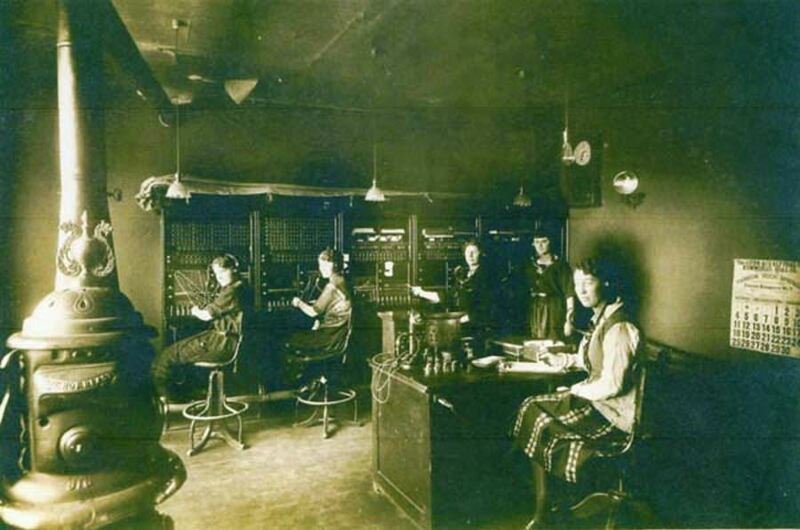 The Nebraska Telephone Company was bought out by Lincoln Telephone and Telegraph Company on January 22, 1912. One of the first, possibly the very first, Lincoln Telephone and Telegraph exchange was located on the south side of Jefferson Street on the second floor of the building in which the real estate office of Tom Wright was located. At the time, the Independent Telephone Company was housed in the second floor of a building across the street north of Wright’s office. This week we get to highlight a man who did so much for a community they named a library after him. In our humble opinion that’s quite the honor. This week’s #ThrowbackThursday post is a 10″x8″ black and white photograph showing Charles B. Washington (left) with another man, both dressed as Santa Claus. 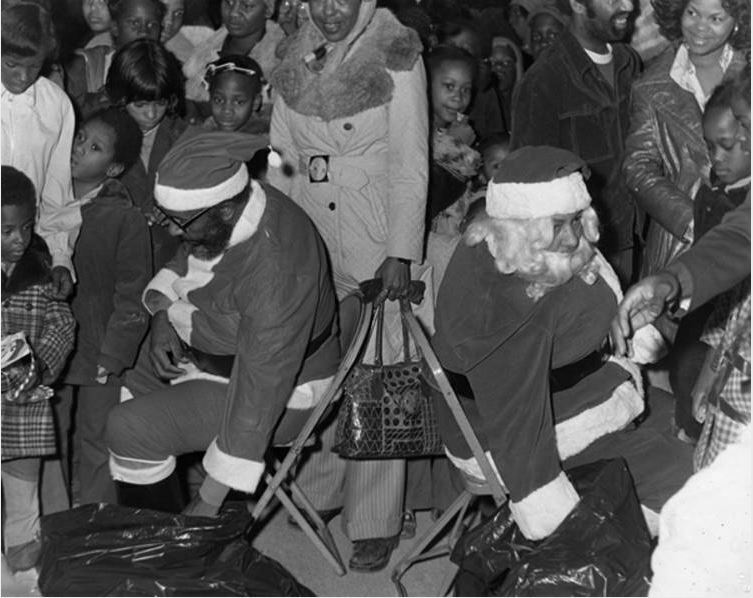 Seated back-to-back, the men reach into black bags, distributing presents to a crowd of children. Charles B. Washington was a American civil rights activist, and journalist from Omaha. On September 14, 1986, the North Branch of the Omaha Public Library was renamed after Washington. 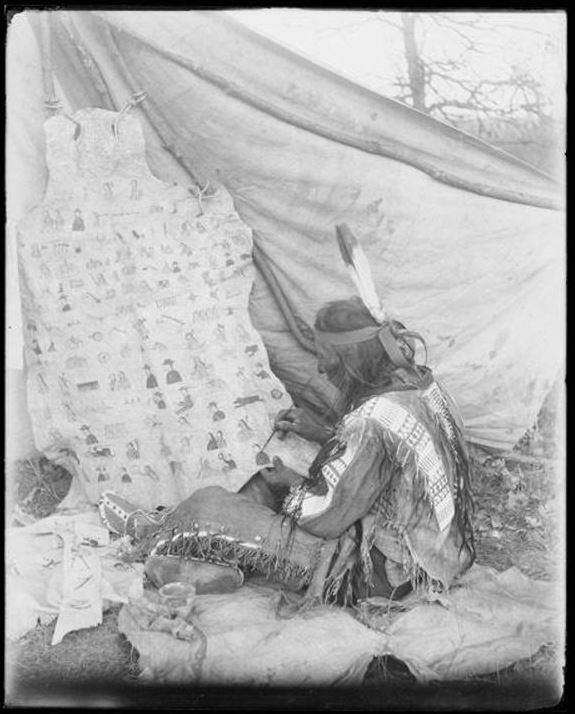 This photo is a part of the Charles B. Washington Collection in Nebraska Memories Archive. Happy Thanksgiving! Let’s celebrate with a 1907 Thanksgiving #ThrowbackThursday! Back in 1907, fans and spectators gathered to watch Nebraska State Normal School (NSNS) at Kearney play Doane College in a Thanksgiving day football game. 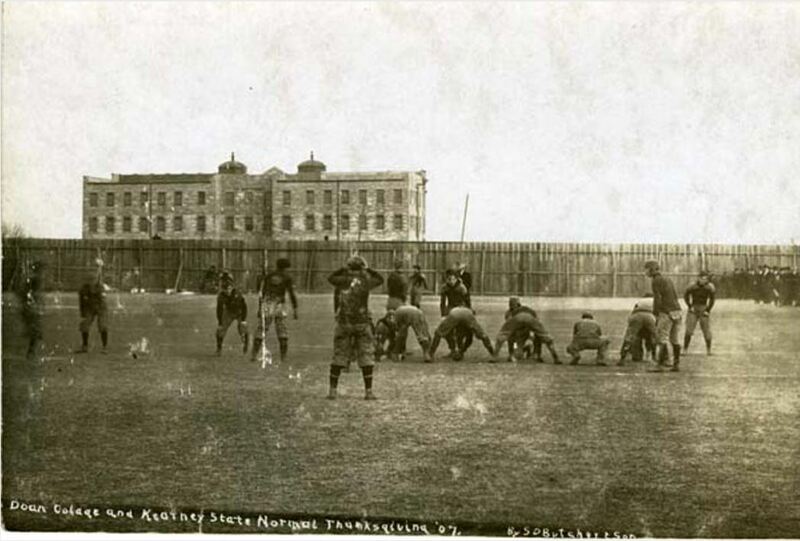 In this 5-1/2″ x 3-1/2″ black and white postcard, we can see the two football teams facing off, a group of spectators standing against a tall wooden plank fence, and in the background, the NSNS Administration Building. Written at the bottom of the card is: “Doan Colage and Kearney State Normal, Thanksgiving ’07 By SD Butcher & Son”. Interested in Nebraska history? Find out more about this photo in the Nebraska Memories archive! Photo provided by the University of Nebraska at Kearney, Archives, Calvin T. Ryan Library located in Nebraska Memories. It’s a tribute to the harvest season with this week’s #ThrowbackThursday! This week we have a 1907-1917 black and white photograph on a postcard. It depicts a group of men threshing wheat with horses attached to a threshing machine as they walk in a circle. In the background is a stack of hay or wheat and more men. 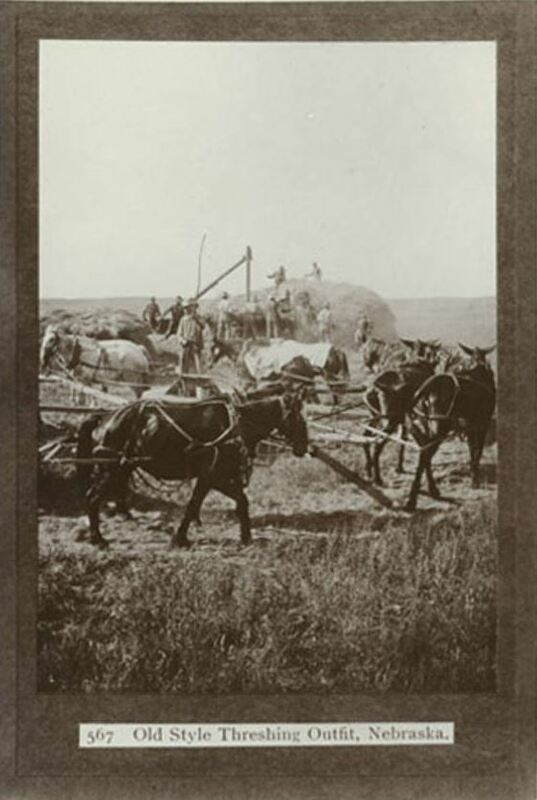 Information printed on item: 567 Old Style Threshing Outfit, Nebraska. Are you interested in Nebraska’s history? Find out more about this photo in the Nebraska Memories archive! Photo provided by the Nebraska State Historical Society located in Nebraska Memories. NLC is proud to honor Nebraska’s many Veterans with this week’s #ThrowbackThursday. 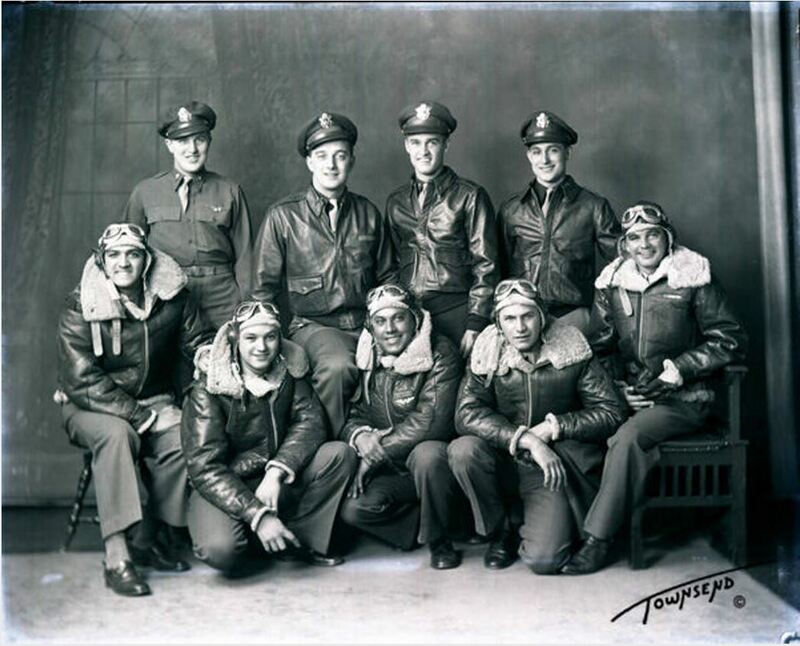 This week we have an 8″x10″ glass plate negative of Lieutenant M.J. Coulter and bomber crew, taken December 6th, 1943. Identified in the photograph are M. Coulter, standing second from the left; W.H. Field, bottom row right and R.D. Espana, bottom row center. Are you interested in Nebraska’s military history? Find out more about this photo and other military items in the Nebraska Memories archive! 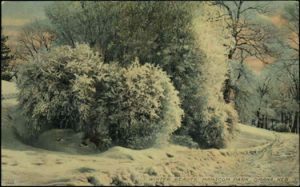 Photo provided by the Townsend Studio collection located in Nebraska Memories. 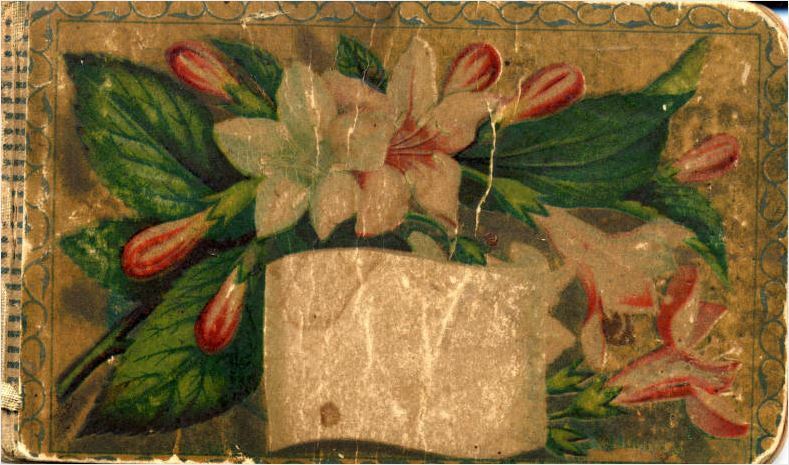 There are over 1,000 postcards in Nebraska Memories and many of them include images of both the front and backs of the cards. I’ve always found it entertaining to read the messages written on the postcards. It wasn’t until the past year or so that I started to really pay attention to the postmarks on the cards. I’ve always looked at the postmark to see what year the card was sent but the postmarks can provide additional information. Let’s start with the basics first. 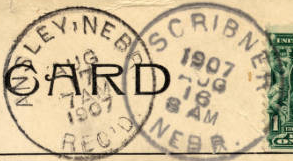 Most, if not all of the postmarks that I’ve looked at in Nebraska Memories include the day, month, year and time of day along with the name of the town. 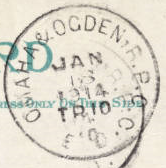 The postmark above is on the back of a postcard of the Hanson’s Café. 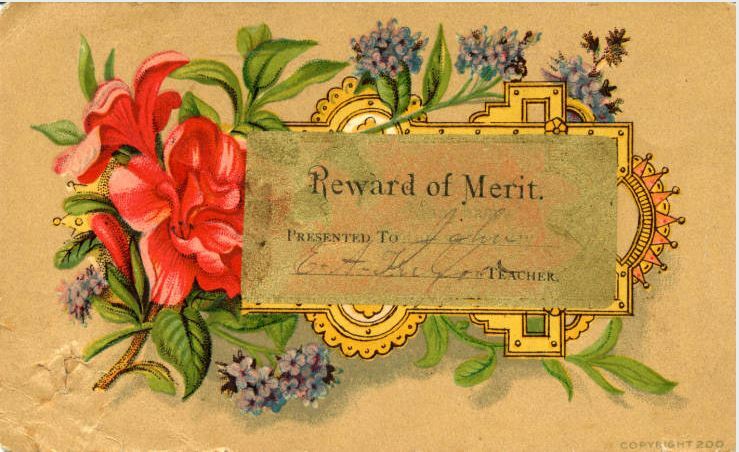 You can see that it was postmarked on July 13, 1909 at 12 midnight. This card was sent from South Omaha, Nebraska. In 1909, South Omaha was its own town. South Omaha was annexed by Omaha in 1915. On a side note, I always like it when I can connect unrelated items in Nebraska Memories to each other. 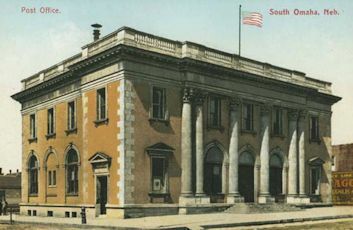 In this case, there is a postcard of the South Omaha Post Office in the collection. The post office building was completed in 1899 so it’s possible that the postcard of Hanson’s Café passed through that building. The post office building is still being used as a post office today. Some postmarks contain more information. 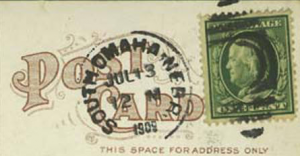 The image on the left is the postmark on the back of the Omaha Boulevard, South West, Omaha, Nebraska card. Do you see where it says Union Depot Postal Site? I think the last word is “site” it is hard to read. I’m assuming that means the card was cancelled at the Union Depot. This postcard of the state capitol at night was postmarked On Mary 14, 1912 at Station C in Lincoln. I know Station C doesn’t mean a lot on its own but I checked a few of my favorite research sources and found just what I was looking for in the 1918 Lincoln City Directory. Page 49 in the book provides a wealth of information about the post offices in Lincoln. The book provides the location of the main Lincoln post office plus the locations of stations A, B, C and 1-7. According to this information, Station C was located at 716 N 27th street. That’s about at the corner of 27th and Vine Street. The last type of postmark I want to highlight is the RPO postmark. RPO stands for Railway Post Office. I didn’t know anything about RPO until I started doing some research for this blog post. I learned that mail clerks road on the train and sorted the mail as they went and it was a dangerous job. If you would like to know more about railway mail service, the Smithsonian provides a great history of the service. There are two postcards in Nebraska Memories that have RPO postmarks. They are both for the Omaha & Ogden (Utah) route. The postmarks contain the date and time information along with one unique piece of information. The postmarks also include the train number. 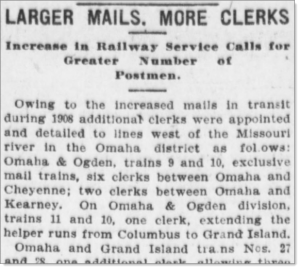 An article in the Jan 1909 edition of the Omaha Bee talks about how the increase in mail required more clerks on the railroad lines west of the Missouri river. To the left is first paragraph of the article that talks about the Omaha & Ogden route. I hope you enjoyed learning about a few of the different postmarks. Visit Nebraska Memories to search for or browse through many more historical images digitized from photographs, negatives, postcards, maps, lantern slides, books and other materials. NLC is getting all geared up for Halloween with this week’s #ThrowbackThursday! 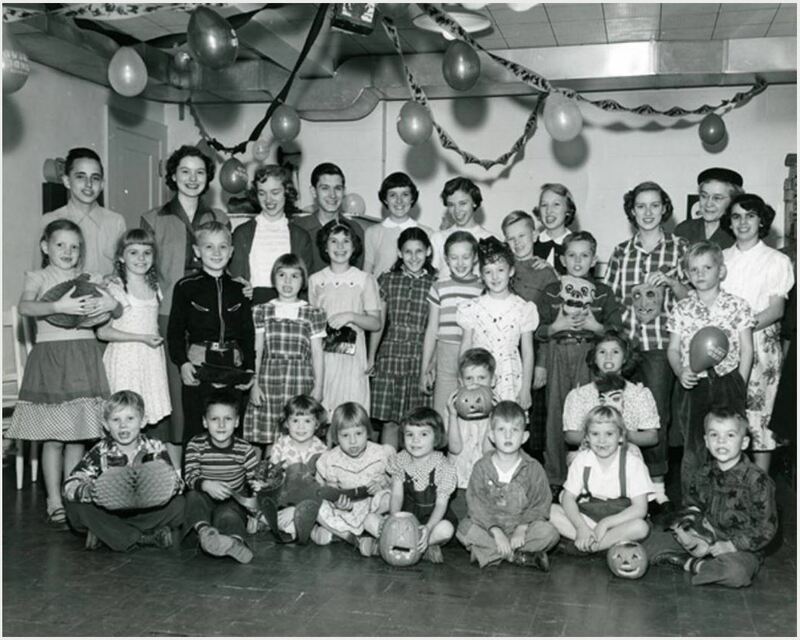 Photograph of children and teenagers at a Halloween party for the Nebraska Children’s Home Society in 1951. Photo provided by the Nebraska Children’s Home Society collection located in Nebraska Memories. Nebraska Memories is a cooperative project to digitize Nebraska-related historical and cultural heritage materials and make them available to researchers of all ages via the Internet. Nebraska Memories is brought to you by the Nebraska Library Commission. If your institution is interested in participating in Nebraska Memories, see http://nlc.nebraska.gov/nebraskamemories/participation.aspx for more information. Some people say change is inevitable, but how much have things really changed over the past 100 years? In 1917, the Nebraska Telephone Co. Building at left was completed in Omaha with a “modern telephone exchange” (Omaha Public Library Collection). There were over 6,000 independent telephone companies in the United States at that time with a fair number in Nebraska. Over the years many of those companies merged or were bought out. Today with the cell phone technology, different service providers, who buy out and/or merge with each other regularly, are again working to provide a new “telephone exchange” by expanding cell phone service to the more rural areas of Nebraska. Transportation was in flux in 1917. While horse-drawn vehicles were still in use in some rural areas, motorized vehicles were taking over–both gas and electric. This brought about the building of automobile dealerships, gas stations, garages, solid-surface roads, and more. The Osborne Garage in Sidney at right was one of many such businesses being built in Nebraska (Cheyenne County Historical Society and Museum Collection). Mechanics today use computers to tune-up cars and trucks, but the basic need is still there for new tires, oil changes, etc. Now new dealerships and their garages are being built on the outskirts of town. And while gas cars won out for a number of decades, electric cars are making a comeback and bringing about the construction of re-charging stations. And who doesn’t run into road construction–or the need for it–on a regular basis? The population growth in early twentieth-century Nebraska brought a demand for amenities such as public libraries. At least 72 Nebraska towns erected new public library buildings between 1900 and 1920. 1917 alone saw the construction of at least nine public library buildings, two of which are still used as libraries: Cordelia B. Preston Memorial Library in Orleans and Arcadia Public Library at left (Nebraska Library Commission Collection). Other libraries have had to move on from old buildings to new buildings as technology has brought demands for different services. In 2017, Blair Public Library and Scribner Public Library both celebrated grand openings of their new facilities. Live entertainment was popular in 1917 as it is today. In the Boileau Chautauqua Company photograph at right cast members in costume pose in a car. 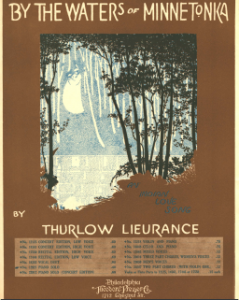 (Townsend Studio Collection). As the banner on the rear promotes the model of the car, perhaps this is an early example of promoting products for corporate sponsorship. While many people still traveled by train in 1917, touring cars (open cars that could carry five or more passengers a long distance) would become popular. A car allowed more flexibility in timetables and destinations. Today many entertainers move on to their next venue in tour buses. So visit Nebraska Memories and see what old things or concepts are new again among the many historical images digitized from photographs, negatives, postcards, maps, lantern slides, books and other materials.